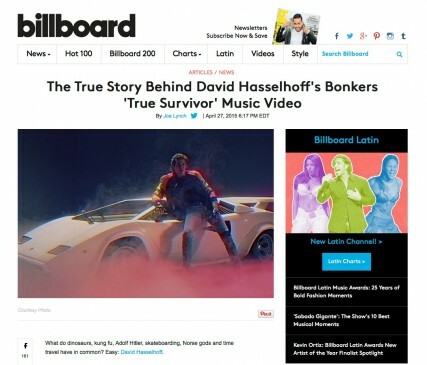 Published on Tuesday, David Hasselhoff in this comprehensive interview for Billboard tells the story behind recording Jörgen’s True Survivor, the theme song for the upcoming Swedish short film Kung Fury to compete in Cannes next month. So I flew to Sweden and got into the studio with one of these writers and heard the track and I thought, “Wow, this is terrific.” It’s definitely a throwback to those Kenny Loggins ’80s tracks that I love. When I heard the track, I went ballistic because I knew I could sing it. It comes from the ’80s! That’s where I have my big hits, it’s the music I organically love. It was the days of Queen, Prince, and Michael Jackson’s heyday.